In 1910 the Palace Administration of Tsarskoe Selo published a book to commemorate the 200 anniversary of the founding of the town. It was a deluxe edition with portraits of the Emperor and his family at the begining of it. The book was very popular in Russia at the time and has been recently republished there in Russian. In the same year the book was published a Neo-classical bathhouse was converted into the first official museum of the Tsarskoe Selo and it was inaugurated by Nicholas II and his family, who were the foremost residents of the town at the time. Russians of the time and hence have considered the town of Tsarskoe Selo a cultural treasure of the highest importance. Many people around the world love Tsarskoe Selo as a second home - either real or imagined. 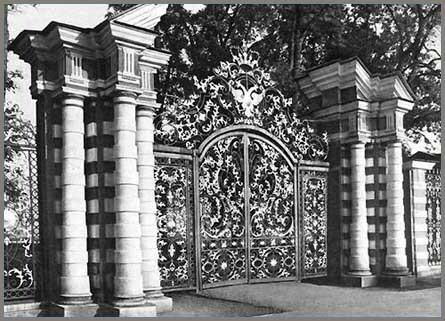 Tsarskoe Selo had been established as a country retreat by Catherine I, wife of Peter the Great. The source of the name of the town is, as this book points out, somewhat obscure. It seems the root of the name is found in the Finnish language and the inhabitants of Tsarskoe Selo were Finnish at the time of the town's founding. In any case Tsarskoe Selo came to be known as the Tsar's Village. In truth it existed almost solely for the pleasure and benefit of the Russian Sovereign and his family. It began as an Imperial estate along typical Russian lines of organization; established not only as a retreat but also for hunting, exploitation of the natural resources and for farming. Tsarskoe Selo has always had unique advantages over the nearby capital city of St. Petersburg and these have become more pronounced as Petersburg has grown. 16 miles from St. Petersburg and less than a day's ride by carriage it was close enough for it's masters to keep close tabs on the reins of Imperial government, but too far for idle visitors from town. Being an Imperial estate, for a long time foreigners had to be invited to visit the town and there were virtually no rentable rooms or cabs to encourage anyone without Imperial business to make temporary residence there. It was a desireable place to be. Tsarskoe's elevation above the marshy lowlands of Petersburg, slight as it may have been, afforded an escape from the polluted air and cutting frosty winds which blow between Lake Ladoga and the Gulf of Finland. Excellent water and fresh air were other virtues of the location - which became increasing critical as the Petersburg basin became more and more polluted throughout the 19th century. While the waters of St. Petersburg's wide Neva River were celebrated as healthy and remarkably drinkable in the late 1700's, less than 50 years later they had become deadly and a source of disease. Over the years a series of Russian rulers from the Romanov Dynasty continuously embellished 'their' Tsarskoe Selo. Using the Great Palace as their starting point they expanded buildings and gardens until hundreds of acres had appeared dotted with splendid palaces, lush gardens, pavilions, monuments and amusements. The only exception was Paul I, who resented Tsarskoe Selo because of the indelible mark his hated mother, Catherine the Great, had put on the place and he did everything it could to ignore Tsarskoe Selo in consequence. While the vast gilded halls and silken glass and amber-encrusted walls of the palaces indicate a sybaritic love of beauty and a sensual delight in texture, color and a blatant expression of the glories of power and wealth, another side of the story of Tsarskoe Selo is more intimate and, perhaps more telling. Here successive Romanov rulers strove to create an ideal world where reason, high culture and a rigidly patriarchal society might prove an example which could overcome and overawe the vast and inscrutable forces which seemed to capriciously rule the Russian land. This world had at it lofty pinnacle the person of the Emperor or Empress of Russia. Like a Queen bee he (or she) stood at the top of a vast pyramid of power that existed for the benefit of the Ruler and derived its descending power down the pyramid directly from the throne. Without a strong Tsar or Tsarina at the top to control the the system there was no other force powerful enough to prevent society from unraveling like a collapsed house of cards. The strength - or perceived strength - of the current occupant of the throne was the glue that held the system in place. Being Tsar was a tough job. It killed almost anyone who took it on. 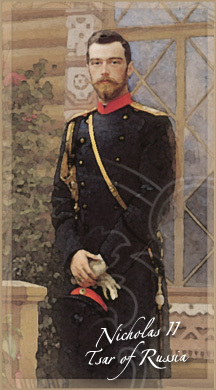 Alexander I, Nicholas I, Alexander II, Alexander III and Nicholas II were all completely worn out and ultimately destroyed in turn by the strain of the responsibility. Only Catherine the Great seemed to enjoy and thrive on it, but she was one of the greatest women of history and stands in a league of her own. The stress of being a Tsar was enormous and unrelenting. The occupants of the throne tried to escape as much as possible from the capital to their suburban palaces for peace and quiet. Delightful Tsarskoe Selo was the favorite choice of many Russian Tsars and Tsarinas and they found it much easier to do the job of government here away from the sound, odor and bureaucrats of Petersburg. In 1910 Russia had recently undergone enormous changes brought on by the rapid development of the economy and the inability of social and governmental institutions to cope with it. This had resulted in the then recent bloody revolution of 1905. Although the deadly undercurrents which would ultimately bring down Imperial Russia were obvious to all who looked for them, the solutions to these problems were less obvious. Irreconcilable political partisanship and the vast gulf between the consciousness of the elite, urban populations and the life of the countryside; combined with an utter disdain between all classes proved too much for Russia when WWI pushed her toward the brink. Until the war Russia had made enormous progress in developing her economy; the country had some of the freshest and most creative minds in the western world. The status of the peasant - who represented the vast majority of the population - was improving consistently. Industrialization was advancing rapidly and it was commonly anticipated at the time that Russia would have been the great economic success story of the 20th century. In this book one will encounter a world that seems to have no sense of it's imminent extinction. The dazzling beauty of the town mesmerized it's inhabitants and visitors, ultimately blinding them to the ebbing strength of the institutions that had created and sustained Tsarskoe Selo. With the hindsight of history we can look back on this ill-fated world with the comfortable certainty of facts and events that occurred after the publishing of Tsarskoe Selo. Reading the book it is hard to believe that all would be gone in just eight short years. The books dwells at great length on the physical apparatus of the town and amusingly spends a great deal of time breathlessly gushing about recent improvements in waterworks and plumbing. I wonder if the author, Viltchkovsky, was not involved in these projects themselves, for they are as fascinating for him as any Romanov palace. In his book the architects, chief administrators and bureaucrats of Tsarskoe Selo are the real builders of the city. By the time you have finished reading this book you will know, perhaps, as much about them as the famous Tsars and Tsarinas who lorded over the place. Since the book is an official publication the criticism of the conduct of some of Russia's rulers in it is something of a surprize. The candor about Catherine the Great's love for Lanskoy, Paul's craziness , the moodiness of Alexander I and Nicholas I's love of flowers and family is refreshing and somewhat jarring. Here Russia's mythical rulers come across as real (and rather touchy) people - living, breathing and having carried on day-to-day life in actual places where the 1910 visitor could touch and feel the most intimate relics of their existance. In 1910 there were still people alive who could remember the funeral procession of Alexander I in 182639;s. This usly absent from the book are details on the life of the last Tsar, Nicholas II and his family. The book is a black hole when it comes to specifics regarding the then current Monarch. Although he and his family had made the Alexander Palace in Tsarskoe Selo their official residence since 1906 the book skims rapidly over this palace. There are no floor plans or a room-by-room description of its splendors as there is with the Great Palace. The reasons for this omission may not be only an obvious concern for security. If security was the objective of reticence about the day-to-day life of the last Imperial family then there would be no exact description of the location of the palace electrical and water systems. Perhaps terrorists of the time had not yet conceived of poisoning the Tsar's bath, yet I think the lack of more information on Nicholas and Alexandra has more to do with the "Imperial dignity" and the family's obsession with privacy than anything else. We are deeply indebted to Carl Reeves Close for this online edition of Tsarskoe Selo. He discovered an old tattered English translation of the book from 1911 and shared it with me. I have edited some of the text (mostly reducing a mysterious and obsessive use of the comma), and have added a large number of photographs from my personal collection. I have also included a few photographs from "Pamyatniki Architecturi Prigorodov Leningrad", a Soviet book published in 1985, to fill out monuments that had no photographs in Viltchkovsky's book. I have also omitted a number of photographs of palace interiors from his book in order to keep the load time of pages down. I will add more if website visitors tell me they want to see them. Putting this book on the web has been an Herculean task. I did it in my spare time, staying up all night in some cases laboring over the scanning and OCR of hundreds of pages. When I first saw the book I frankly hesitated for a moment about putting it on the Internet. To be honest I had some inclination to say to Carl we should, like mice hiding a valuable treasure in a hidden sanctuary, keep the book for ourselves and a few friends to enjoy. I have always believed that the more people know about Tsarskoe Selo and palace life the more people will understand Nicholas and Alexandra. With that objective in mind I felt we should share this book with you and everyone else. I hope you enjoy the online book and all of the other Russian sites I have created. A special thanks to A La Vieille Russie for their encouragement of the promotion of Imperial Russian studies on the Internet, Jack and Dodie Moshien for their consistent support of my work, and the moral encouragement of Rob Moshein and Larry Hokanson. Thank you to Frank Warren who helped with spelling errors that my computer didn't catch. I also must thank Suzanne Massie for opening this world to me and to my dogs Boris and Ennis for keeping me company while I labored over the scanner and my poor old Power Computing Mac clone.